Excitement over Lucia’s first violin lesson – we are trying it out to see if she’s interested! All I ever listen to in the car is the symphony (or if Lucia’s not in the car I might be listening to NPR) – she has grown up loving classical music. That makes me ridiculously happy! A quiet weekend ahead – after some travel, having fun visitors with us and the chaos of integrating our new puppy… I am ready for a weekend at home. Sushi – when it’s been two weeks since we’ve had sushi…it’s been far too long. Trying to make that happen asap. How’s your week going? Thanks for stopping by! 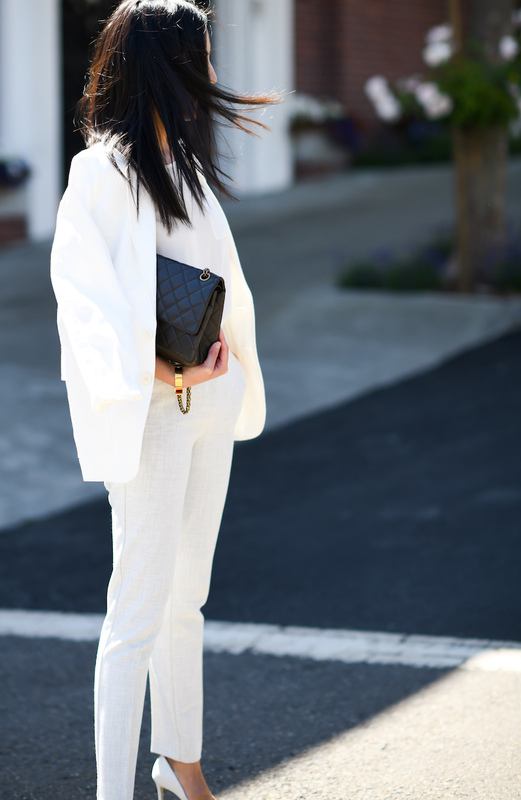 In love with your elegant white on white look! Loving this suit! And a quiet weekend at home sounds amazing! Always beautiful and classy look! ???? A classic and beautiful outfit! Total white looks are some of my fav! Your blazers always look so chic! <3 🙂 Love the way you styled it with these trousers! Always looking impeccable and this Summer suit was made for you to wear it! Aww I played the violin for 10 years. Towards the end of my time playing I was ready to move on but, now some 15 years after hanging up my bow, I see how it shaped me. I really hope Lucia loves it. I actually read a post you wrote previously about listening to classical music in the car, and a few weeks later just happened to be out for a morning of errands and turned on the classical instead of my usual NPR. and it was such a peaceful moment of joy. Thank You!